Most General Motors enthusiasts probably know Katech for its relation to Corvette Racing and its numerous other motorsports endeavours. Katech built the V8s engine that powered Corvette Racing’s Corvette C5-R and Corvette C6.R GT1 to a myriad of victories, including six class wins at the 24 Hours of Le Mans, and also helped Cadillac Racing achieve its championships in the SCCA World Challenge series with the Cadillac CTS.V.R Sedan and Coupe. The fifth-generation FIA Chevrolet Camaro GT3 car also used Katech power, along with the Grand Am Chevrolet Camaro GT.R and..well, you get the picture. The company has expanded its business beyond high-performance racing engines in recent years and today has a wide portfolio of powertrain-related services available to consumers, race teams, OEMs and anyone else who could benefit from its technical expertise. It recently put together a video documenting its new GM LSx-based alternative fuel engine, which makes 1,000 lb-ft of torque at engine speeds of just 3,000 rpm using liquid petroleum gas (LPG). This engine is destined for use in Class 6 passenger buses in Europe, or city buses with a maximum weight of around 26,000 lbs. Katech says that in addition to this LPG engine, it can also produce similarly high-output engines using compressed natural gas as a fuel. It’s planning on putting the engine into production in numerous locations as well, allowing it to more easily serve the global market. The alternative fuel V8 will only be built at Katech’s HQ in Michigan to begin with, however. Katech’s CEO believes the internal combustion engine will always be around and thanks to mass transit, shipping, heavy industry and other such applications, he’s right. The fuel type could change though, especially with regards to industrial applications, which is why Katech is diversifying its business and working on cleaner, more efficient engine designs. 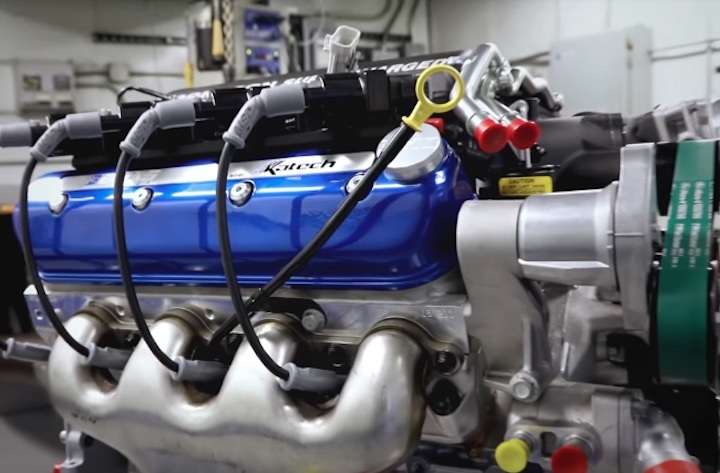 Hear what Katech has to say about the alternative fuel LSx engine in the video above. Natural gas has been used for many, many years in automobiles and trucks successfully. Not sure why it ceased. We had a Chevy motor home with a 350 cu.in. engine that ran on gasoline or propane. No problems. Not if that nut cortez and that so-called green new deal comes, if this happens, they will ban all fossil fuels. LPG runs pretty clean. My RX-7 rotary meets emissions. The engine internals of service vehicles (like shuttles at airports) run 500K miles on propane and still look clean. Stuffs great. Roush has built LPG Mustangs too. Best part is that there’s an abundance of propane right here in the ol USA. At Holden in Australia, we did a huge amount of work with LPG in the old 3800, the HFV6 and LS engines. The management system was brilliant with an almost undetectable switch from petrol to LPG. Most cabs used LPG almost exclusively, it was about 50-60% the cost of petrol but not quite as economical. Now local vehicle production has ceased, Toyota Hybrids are the vehicle of choice and LPG is becoming obsolete. We did some good work on CNG as well, but development ended when the Engine Test Lab was shut down. CNG and LPG has been around for a long time. Municipalities, bus lines, garbage trucks and fork lifts companies just clamour these fuels for lower fuel cost, cleaner emissions and longer engine life with less maintenance cost. Why it never really took off for passenger vehicles is the fuel supply infrastructure. But for the commercial markets such as omnibuses, delivery company’s and municipalities, it’s an easy setup where there usually are train mechanics and personnel to deliver the fuel to the vehicles at there own depots.